I love cheeseburgers! Besides pizza, cheeseburgers are the other food that I actually crave. I like my cheeseburger with extra cheese, mayonnaise, lettuce and tomato. Once in a while, I like bacon on it as well – and maybe some BBQ sauce. My favorite fast food cheeseburger is at Checker’s, either the Cheese Double Cheese, Checkerburger with Cheese, or Champ with Cheese. But I will eat cheeseburgers from any fast food joint. McDonald’s McDouble off the dollar menu is a great deal and satisfies the craving. Wendy’s Jr Cheeseburger Deluxe is also yummy for under $2. Restaurants usually have great cheeseburgers, bigger and fresher than the fast food places. My favorite local restaurant cheeseburger is at Bare Bones Restaurant. Their cheeseburger tastes like it is right off the grill. Such a great flavor! 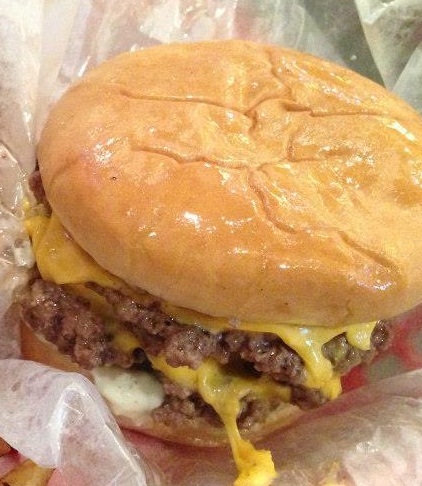 My favorite overall cheeseburger anywhere is the Triple Triple from Dyer’s on Beale Street in Memphis. It is the greasiest, cheesiest, messiest, yummiest, cheeseburger ever! Part of its greatness is that Dyer’s uses the game grease, strained daily, since it opened in 1912.